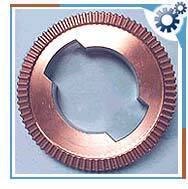 Powder metal makes excellent gears of high quality. It creates quiet, self-lubricating gears. They are many advantages in utilizing powder metal parts in any mechanical assembly. Very close tolerances and repeatability over millions of parts adds to the productivity of automated assembly. Excellent surface finishes create a high wear resistance part with longer life, adding value to the product. Powder metal gears create stronger gears that accommodate greater loads. They tend to retain their dimension better as temperature and humidity changes. They are less expensive and can be designed with less effort. Powder metal parts are widely used for magnetic devices. The most common materials used are silicon iron, phosphorous iron and high purity iron.